Under NHM, 100/50/30 bedded state of the art MCH Wings are being established In District Hospitals/ District Women's Hospitals/ Sub-District Hospitals/ CHC-FRUs to overcome the constraints of increasing caseloads and institutional deliveries at these facilities. 470 dedicated Maternal and Child Health Wings (MCH Wings) with more than 28,500 additional bed have been sanctioned in 18States. NHM, U.P. is seeking applications from eligible candidates for 900+ contractual vacancies in 24 districts, under the MCH Wing. 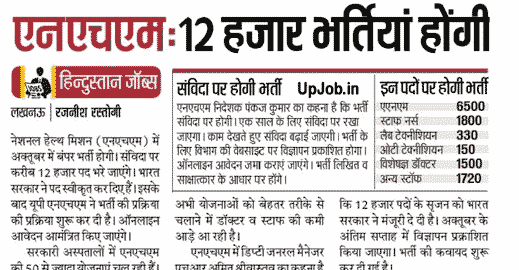 National Health mission Uttar pradesh UP-NHM now going to invite online application form for 12000 posts of different category. All eligible candidates can fill application form online from end of October 2018. Applicants applying for Laboratory Technician and OT Technician shall have Registration with State Medical Faculty, Uttar Pradesh. Only on line submission of application is acceptable. Please visit www.upnrhm.gov.in or www.sams.co.in for detailed IDs and information regarding eligibility, essential qualifications, experience, salary and age criteria, district wise vacancy details for each post. Rashtriya Swasthya mission published the official recruitment notification 18B/SPMU/DAP-HR/2017-18/3862 / 23/07/2017 for inviting online application form for various categories of the posts. All eligible candidates who hold the eligibility criteria they can fill application form online at the official website of Pariksha Up nic In. National health mission vacancy online registration form submission will be started from 27 July 2017. Last date of application form submission is 14 august 2017. Chikitsa Swasthya avam parivar kalyan , will fill total 4688 posts of ANM, Staff nurse, PRO, lab Technician , lab attendant, posts through this recruitment. Contractual vacancies details of ANM, Staff Nurse, PRO, Lab Technician and Lab Attendant under NHM, UP. 10 + 2, Degree in Medical Laboratory Technology (MLT). candidates are required to pay application form fee for through state bank payment gateway. Candidates can also pay application form fee through Dbeit card , credit card , or net banking. Download Notification for NATIONAL HEALTH MISSION, DEPT. OF HEALTH AND FAMILY WELFARE, U.P. Job Notification 2017.